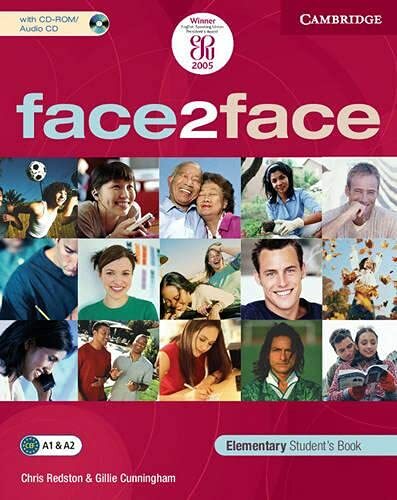 face2face is a six level general English course for adults and young adults. It goes from Starter level through to Advanced. The Student's Book provides approximately 80 hours of core teaching material, which can be extended to 120 hours with the inclusion of the photocopiable resources and extra ideas in the Teacher's Book. Each self-contained double-page lesson is easily teachable off the page. The Student's Book comes packaged with a free fully-interactive CD-ROM/Audio CD with over 200 exercises in all language areas, video, games, recording capability, progress chart and customised tests (please note that the Class Audio is available separately). There is also a selection of material from the Real World lessons which can be listened to on normal CD players. The Student's Book provides approximately 80 hours of core teaching material, which can be extended to 120 hours with the inclusion of the photocopiable resources and extra ideas in the Teacher's Book. Each self-contained double-page lesson is easily teachable off the page. The Student's Book comes packaged with a free fully-interactive CD-ROM/Audio CD with over 200 exercises in all language areas, video, games, recording capability, progress chart and customised tests (please note that the Class Audio is available separately). There is also a selection of material from the Real World lessons which can be listened to on normal CD players.